Where do I begin? This has been an INCREDIBLE few months as we have studied the life of David together!! Thank you for sharing this journey with me. You have worked so hard! Even if you were unable to complete each and every week’s homework, you set your heart on studying God’s Word. 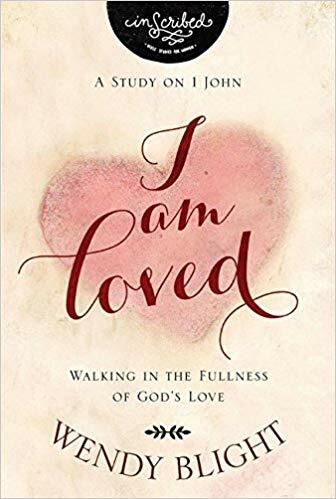 I pray that through this study you have grown closer to God and that you have experienced Him in new and fresh ways that have changed and transformed your hearts forever. Time and time again, your comments have brought tears to my eyes. They reveal the work God has done in and through our time together, and that blesses me more than you will know. It is why I do what I do. Abba Father, thank You for instructing us and teaching us through the life of King David. Thank You for taking each one of us deeper still with You. Thank You for the privilege of walking alongside these beautiful women. As we end our time together, I ask that You continue to counsel and watch over these precious sisters in Christ. Thank You that Your eyes will be upon them and Your ears attentive to their hearts. Father help them pursue a heart that reflects that of your servant David. Give them an undivided heart set on You and submitted to You. Through the power of Your Holy Spirit enable them to surrender every area of their lives so that they can live in a way that pleases You each and every day. May they continue to hunger and thirst for Your Word. Bless each on of my sisters as they faithfully continue their journey with you. I ask this in Jesus’ Name. Amen. Below please find our last and final video for this study. I recorded it with a sadness in my heart because our time together is over. Thank you for your sweet words of appreciation. They mean so much to me and feed my soul. Bible study is what makes my heart sing!! Please leave a comment today and share one way God has changed your heart to make it more like His. From your comments, I will select one name to receive a copy of the One Year Chronological Bible. I will announce the winner a week from today. My dear friend, Wendy Pope, hosts a year long walk through the Chronological Bible, and I encourage you to stop by her blog to see what it is all about. 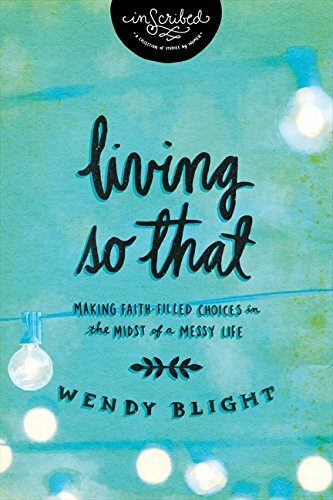 It is a wonderful way to stay in the Word, and Wendy is a great Bible teacher. Although our study is over, please be sure to stop by and say hello as time allows. 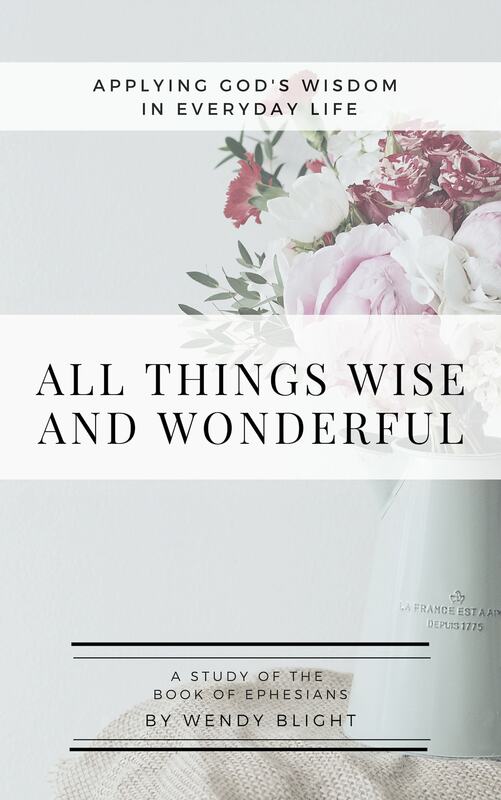 Also, please don’t forget that I do have a Bible study E-book available for purchase through Proverbs 31, All Things Wise and Wonderful: Applying God’s Wisdom in Everyday Life. 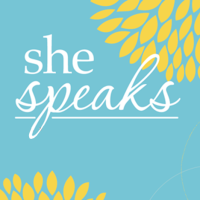 The cost is $10, and it is a great study to do individually or with a small group. 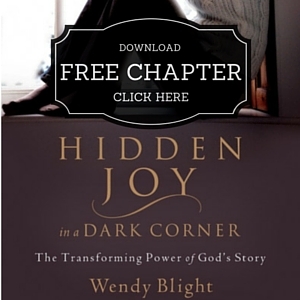 You can also find my book, Hidden Joy in a Dark Corner: The Transforming Power of God’s Story , for sale on the web site as well. Please remember to be notified of any upcoming studies, I need your first name and e-mail address. If you have friends who might like to participate in future studies, please send them my way. They can contact me on my blog, via facebook, or via e-mail at deuteronomysix@aol.com. This study for me has began an incredible journey and i am so grateful to you… One thing that i wanted to do was just finish the study.. only too often do i start something and leave it hanging because i got bored felt overwhelmed and just defeated.. soo i tasked myself to finish this study and right now am finishing up with the second half of week six's lesson… am soo proud of myself… this has given me the confidence to start something and know that even when i feel like giving up i should press on cause they joy of seeing something to the end is amazing….Wendy this study has also brought the bible to life for me… i could actually relate and i really enjoyed the readings….I am so glad that i signed on and i can't wait for you to come up with another study.. till then i am gearing my self up for Wendy's one year through the bible study am soo excited and i want to find a few friends and encourage them to join cause i know that will definitely make it easier!! Thank you and God bless you!!!!! The journey through this bible study has been an eye-opening experience for me. As I have been pondering over the Word of God each and every lesson, the Holy Spirit has been confirming things to me in a continual fashion. I don't really remember how I ended up at this bible study, but God knows and has used it to transform many areas of my life. The most pivitol time came as I looked upon the words that David spoke to the people as he prayed at the end of his life in Chronicles 29:18 as he tells them " to direct and establish their hearts toward Him", and I began to think about the importance of his last words to the people how the Psalms over and over repeated that David had a steadfast heart, that his heart was fixed on God. You see just one day before doing this study I went up for prayer at my church, because I knew where I was supposed to be but I wasn't there yet. You know "stuck" between here and there in the process of fulfilling the will of God in my life. What the Holy Spirit revealed was that I was stuck, but unlike the heart of David my eyes were "stuck" on my circumstances instead of trusting God to complete what He started. And He began to show me all the areas of my life where I spoke about trusting Him, but truthfully I didn't trust Him at all. So thank you for your dedication to time and prayer regarding the Word of God. His Word never comes back void as He always watches over it to perform it the way He desires in the hearts and minds of many, some whom you may never even know. God bless your every endeavor and keep your heart steadfast that He may establish your every way. I agree with Anonymous who posted 11/14 at 10:47 pm ….I too am confused with 2 Samuel 22:24: "I have been blameless before him and have kept myself from sin." Can anyone shed light on this? I too loooved this study and I am enrolling in the chronological bible study with Wendy Pope and greatly looking forward to that!!! I am already enrolled via email, but want to make sure and establish my interest in future Bible studies. I feel kind of sad. I just got over here and feel like I may have missed something wonderful by not being involved in this particular study. I am interested in future bible studies though. Please put my down for ALLL future Bible studies! I sent you an email but I want to make sure. Thank God for you Wendy! Wendy, This has been a wonderful way to begin the week, and I will look forward to more Bible studies from you. It was such a blessing to study David, and learn more about the man who was a man after God's own heart. He was just a man though, and as sad as it was to read about his sin, it was comforting to know that God still called him a man after his heart. Encouraging because I see my own sin, and know that God can love me unconditionally, in spite of sin. Thank you so much for the time and dedication you put into this study. I loved having it ready on Monday morning and starting the week out with this video. Always made for a great week! Rich blessings for you and your family. I truly enJOYED this study – I have always been intrigued by David, and this was "icing on the cake". It was sad reading how David got "old", tired, and lost his sons. His sons turning on him…how many sons have done that today? How many fathers loving their sons like he did? I know my own dad did not yet both of my brothers loved him. I keep praying that both of them will get to know the REAL FATHER who loves them unconditional!!! Thank you so much for this study!!! I look forward to the next one! I just found your blog, and then the on-line study itself when I went back through some of your archived posts. Very sad to have missed this one, but here I am to say please remember me for the next! (I will also subscribe to your blog). I did your Ephesians study and now the David study. Thank you for your time placed in teaching these. I want to remain on your list for future studies. 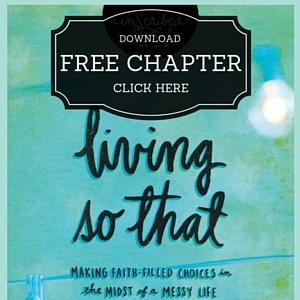 Now, on to your question: Share one way God has changed your heart to be more like his? As I sat here and pondered it was tough to come up with only one. As a sinful person and knowing Gods attributes I would have to say he has made it so I am more aware of who he wants me to become. It is when I acknowledge my absolute worst that I can fully grasp His absolute grace and best for me. Thank you Wendy for another amazing study. God has taught me so much through this..Please add me to all future studies that you do. I wanted to comment on annonymous's question above about 2 Samuel 22:24 it says:"I have been blameless before him and have kept myself from sin." My understanding of this Psalm(song)is that David had repented of his sins and now saw himself as blameless before God, and saw himself as not in the same sin any more since he was forgiven(sometimes we learn and don't want to make the same mistakes again so we keep ourselves from it). I thank you for this study. I have gone through David's struggles with him during this study, realizing that I too am just a woman and will make my mistakes. But especially when we become so comfortable that we leave God out even for a short time ( like even a day!). We must draw close to Him and stay close to Him in Word and Prayer. That is where we get the food that fuels the Holy Spirit. Every time we deprive ourselves of food and prayer, wood and oxygen, we quench the Holy Spirit a bit. And of course when sin comes we quench the Holy Spirit more. So I saw that I must surrender all to God. My strength that is really only weakness without Him, my dreams, for His plan is much better than my dreams, and I must just COMMIT to consistantly walk with Him and go to Him for all instruction on life's path. I read both II Sam 22 and Ps. 18 and fell in love with this Prayer song! I know that God has done all of that for me. He has shown me that I am miserable until I give Him my sins and disappointments. He showed me that He does fight my battles and does not leave me alone. I am excited about the way God has begin to heal my wounds from battles I tried to fight myself, and in the process hurt myself more and others too. But how sweet it is to hear David's last words to his son. And I want to give those words to my children and all who watch my life, by the way I live! For truly God has been gracious unto me and He truly is worthy to be praised. I know God's healing more than ever before. He truly IS MY SHEPHERD and I Shall not want! I have really enjoyed this bible study and I am looking forward to the next one. Through this study I have learned to love the Psalms, especially David's. I have read many of the psalms before but never realized what was happening in David's life at the time. Those same psalms written so long ago can be applied to my daily life. That seems incredible to me. God bless you too, Wendy! God is so amazing. Both of these studies have helped me grow in faith and knowledge of Him, and now he calls me (and each of us!) 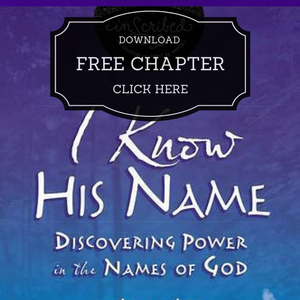 to know him and include Him in each and every aspect of our lives. The best Christmas present ever! A friend who also takes care of me and prepares the way for me, and is with me wherever I go! And the amazing thing is, He can do this for each and every one of the billions of people on earth, as well as the billions before us and after us. I pray God's light shines through each of us as strongly as it has through Wendy, so that everyone around each of us can experience His love, and/or be led to have the Best Friend Ever! Love, hugs, and kisses to all of you! See you at the next Bible study! And in heaven! Once again, thank and praise God for you, and your devotion to God to conduct this study for His people. Though there were a lot of reading for this study but I just enjoyed reading/learning from them. What did I learn from David? Plenty. He started well – he was prayerful & sought God constantly. But, like many humans do, when we became complacent and life is good, we fall easily just like David. Our God is gracious, when David repented & devoted himself to God again – building God's house with his wealth & advising his son to serve God with wholehearted devotion, God blessed him in his last days. I learnt that it's never too late to have a heart after God, like David – always praising God in Psalms and acknowledging God as creator & owns everything that David owns. This study gives me a desire to pray & praise more & constantly seek God to guard against sins. Thank God for His truths! This study has been an incredible lesson for me. I've come to a point in my life where I need to "check in with God" before I make any decisions, to learn that I really don't have control, and that there is always a bigger purpose. I want to strive to be more like David in that aspect. Thank you so much and I most definitely look forward to your next study. I say Hi Wendy, each Monday..but now it's over, I have had to take a good look at my heart thru this bible study, I love the Lord and he is opening my eyes to things that I need to work on. I will continue to grow and try to submit my whole heart to God, I just plain forget sometimes to ask the Lord for help first, but I am working on giving it all to the Lord, he has made so many changes in my familys' life these past few months, so I know he has great plans for me. I thank God for bringing you in my life especially when I truly needed His Divine intervention! I have been going through some disciplining from God and through the study of David, so many things have been reveled to me by the Holy Spirit. I have learned so much and am applying what I learned in my life and the life of my children. The most amazing thing is that now I can't move without checking in with God. I pray before my decisions and plans. I have put my faith in God, I have learned from David that the minute I realized I have done something out if line with God I immediately confess that sin and it's such a relief not carrying the weight of sin with me all the time. Also, the confidence that David had to declare that he was blameless and sunless has made me for the first time realize that once I have confessed my sin, I can declare to God that I am blameless! That God forgives our sin and restore us to a state of sinlessness! What a revelation! I used to still feel guilty on a sin even after I have confessed it but now that is gone! Also the fact that God is a jealous God came more clear when I read about punishing David for doing the census! He wanted David to have faith in Him alone and nothing else. That he hates pride has made me be more conscious of where I put my trust in… I can go on forever! Bottom line is, this study has forever changed my life! I can identify with David and the fact that he committed some serious sins but still, God in his grace, forgave him and restored him is such an encouragement that no matter what I am going through, God's plan will be fulfilled in my life as long as I repent and dedicate myself to following him and staying in His holy will, I too will be restored and blessed!! That all will end well with me! Wow! What more can I want? I thank you for everything and I pray that God continues to bless you so that you may keep blessing others all over. 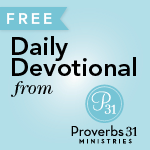 I pray that God grants you "wholehearted devotion to keep His commands, requirements and decrees at all times". May the grace, peace and love of our God be with you and your family. Wendy, I am so happy to have been here for this study!! and for you being a part of my life!! I have grown so close to knowing David better and feel I know him personally that as I finished my study this morning, I cried for David, sad of his death, but joy of what life he spent and always after God's heart.. To know he had such a wonderful life, he Loved his God, he sinned towards his God.. BUT HIS GOD LOVED him no matter what.. How awesome is that.. to know that OUR GOD LOVES us, no matter what we do.. But we most continue to to seek him and acknowledge our sins. I have also loved loved loved this study! I know that God's Word has changed me over this time. I find myself reading the Word and listening to others and christian songs and hearing Him differently somehow, clearer. I feel more open to the challenges His is bringing, more willing to obey. I cant really put all this in words. I am struggling with my own parents' examples as I raise my own children, and this study has shed alot of light on my pride and my unwillingness to repent when I am wrong (and think I am so right!). I am no longer scared to be wrong and admit it and ask forgiveness of others. I dont know how to explain it but I feel less proud about things (ie in the wrong way), I feel like I am walking closer to God and have become more discerning with regard to the enemies lies too. I love God more today than I did when we started this study, and I really do feel like the things I have learnt will stick. He has made good on His promise to not leave me the way He found me. 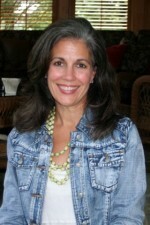 Wendy, I am so thankful for your commitment to praying for me (us), and for being a gentle, graceful woman of God, and I think this has made me feel accountable to you and the other ladies studying, to get in and do the homework, but it has been a joy to be accountable in that way, I have wanted to be accountable in that way. I cant wait to get into the next study with you. PS. I have already got the Chrono bible (and am now going to check out Wendy Pope's blog) and I am sure there is another lady out there who needs it more than me. God bless. 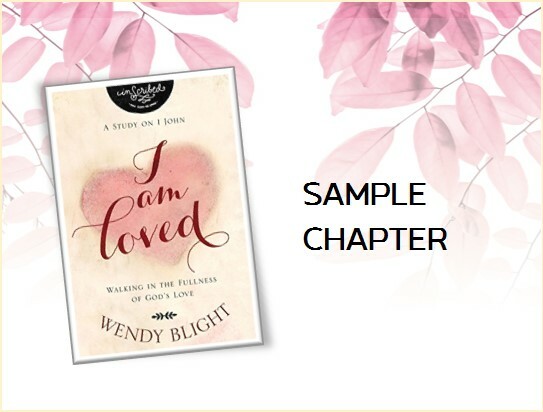 Hi Wendy, I discovered your site a few weeks ago by "accident" – although I really do believe that God wanted me to find the site.. I started doing the bible study about David though I am super behind.. But it didn't matter.. I learned and realized a lot already.. I have only finished the Intro and Week One. I plan to finish through the final week.. and I am so thankful that there is someone like you who would take time to write down all those questions and create a video.. it really does help a lot in pointing me to the right thought.. and what the story is about..
Then the other day, after I watched the video for that, I just thought of browsing a little more and clicked on the Proverbs31 link to check out what's new and I discovered the Chrono bible study Wendy Pope is doing for next year. I got so excited! I have been wanting to read the entire bible but it seemed too hard.. I honestly didn't know there was a chronological bible before so I am so excited to have a chance to read the book in one chronological story.. Pls pray that I will be able to make through the whole year! It is a huge and hard commitment.. Thank you for the wonderful bible study! I am looking forward to more.. and without your site, I probably wouldn't know about the Chrono bible study, which I am also very excited about! Thank you both Wendys! 🙂 You are such wonderful blessings! Beautifully said Lillian! I feel your passion as I read your post and I can so relate to all of it!! Thanks, Wendy, for all that you do for us in helping us get deeper in the Word. My situation doesn't allow me to get to church but once a week for Sunday services, and I miss out on any mid week prayer and Bible studies. So you've been a God-send. I look forward to future studies with you. God bless you and the rest of my sisters who participated! i have learned that i am a work in progress… i have been behind during this whole study but i am learning that every nugget of wisdom God has for me will happen in HIS time… i am learning to claim the promises he has for me and when i get down on myself for not measuring up to the standards of the world i will remember that i am HIS…HIS standards are the only measure worth considering! 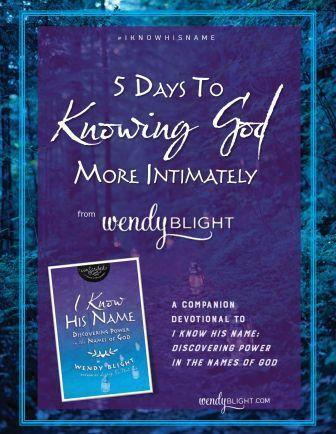 thank you, Wendy, for being a guide and for lighting the way so i can continue to find my way through all the wisdom and promises God has for me in this amazing book of the Bible! Thank you Wendy. I'm new to your site. I was blessed by your study. God bless you for the good works you are doing in equipping people to know the Word of God. My name is Amy and I would love to hear about your next study. My email address is beyondsundaymornings@gmail.com.